Free mainland UK Delivery on web site orders over £150 ex VAT (Excluding Northern Ireland). Red Lion’s Graphite® Edge and Core Controller are rugged all-in-one industrial devices that can the reduce cost and complexity of integrating communication and control, by combining IEC 61131 control capabilities with networking and data visualization. With all-metal construction, a built-in web server and Red Lion’s Crimson® 3.0 software with Crimson Control functionality, the rugged controllers operate in the harshest environments to provide a single programming solution for control, networking and data visualization. Simply use industry-standard IEC 61131 programming languages such as ladder logic, function block, structured text and instruction list to develop code much like a Programmable Logic Controller (PLC) or Remote Telemetry Unit (RTU) without the expense of additional software. In addition, select from a variety of I/O, PID control and communications modules to connect, monitor and control a wide array of devices – regardless of location – to meet specific application requirements. Graphite controllers feature Crimson Control functionality via an IEC 61131 control engine that offers ladder logic, function block, structured text and instruction list programming editors. Easy configuration and a single-solution programming environment eliminate the need for third-party software. With all-metal construction, wide operating temperature and high shock/vibration tolerance, the rugged Graphite Controllers operate in the harshest environments to provide a single programming solution for control, networking and data visualization – regardless of location. The Graphite controllers work with a variety of plug-in modules and expansion racks that can be easily installed onsite to allow for application customization. Available Graphite modules include dedicated PID controllers, digital I/O, analog I/O, high-density thermocouple, RTD and strain gage as well as a fully-isolated universal analog input module. Extend even further with E3 I/O™ high-density modules. Communicating with over 300 different protocols including Modbus and DNP3, Graphite controllers support numerous simultaneous protocols. Use Graphite controllers to manage multiple-vendor applications and network-enable existing equipment. 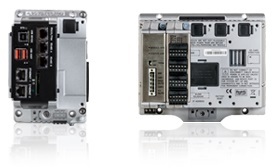 Select and control PLCs, drives, motion controllers or PID controllers directly from the Graphite platform. Graphite controllers excel at keeping personnel informed of machine and process performance. With its built-in web server, remote employees can monitor as well as control equipment from virtually any networked device. Graphite controllers can also provide alerts about existing or pending issues via email or SMS text messages to ensure problems are addressed quickly in order to minimize downtime. With its built-in data logger, Graphite controllers offer a powerful means for recording continuous data as well as events and alarms. Data can be acquired from any connected devices and compiled into CSV-formatted files, where it can be stored, displayed, emailed or automatically synchronized with an FTP or Microsoft SQL server. Red Lion’s powerful free Crimson® 3.0 software is a remarkable programming platform that unlocks the power of the Graphite platform with simple drag-and-drop, point-and-click configuration. And unlike competitive controllers that charge you extra for cumbersome software, Red Lion’s Crimson software is included with each Graphite controller.